The other day, we were discussing my blue alien hands that were enrobed in some strange material while I embroidered. Due to the usual wear and tear on the hands from typical household work – not to mention some non-typical work – my hands were having a rough time of it with silk thread. I received a regular heap o’feedback on the site and via e-mail, with all kinds of suggestions for remedies. Thank you so much for your input and ideas, everyone! Wow – lots of solutions for rough handed stitching! Thank you, thank you. I’ll definitely test some of them. On the market today, there are several lotions that are made for stitchers. I thought I’d give you my take on two of them, and tell you why I prefer one above the other. This is called “Stitchers Lotion”. It’s an unscented, non-greasy hand treatment that you’re supposed to be able to use right before you stitch without any adverse effects on your threads or fabric. It’s available at many local needlework shops – if you have a cross stitch shop or a needlepoint shop or a fine needlework shop in your area, chances are, they carry this. This well-worn and more or less empty tube of hand cream is made specifically for Au Ver a Soie, the French silk thread company that makes the best range of silk threads for hand embroidery available today. The cream is meant to be used by stitchers working with silk, and in fact, it is so thread-safe, that the manufacturer recommends it for conditioning the thread as well, to tame it up a bit if necessary. So not only can you rub the stuff on your hands right before you stitch (a little goes a long way – and don’t expect a perfumey, flowery smell – it has a very unscented, oatmeal-like smell), but you can also run your threads through it. Stitchers Lotion (the first photo, above) runs about $4 or $5 for the tube. It’s very affordable. Au Ver a Soie hand cream runs about $15 for the tube. It’s a bit more expensive. Hence, the picture of the empty tube – I don’t buy the stuff too often! But this is the thing: if I need to put a lotion on my hands as I stitch because of a serious snagging problem (especially when under pressure to get something finished), I am much more confident about putting Au Ver a Soie’s lotion on my hands, because it all boils down to the thread. Au Ver a Soie knows silk. If this is the cream they sell to use with their silk, I feel perfectly confident that it cannot be harmful at all for the thread, now or in the long-run. Otherwise, they wouldn’t sell it. Stitchers Lotion is not specific for any type of stitching or thread, so that leaves me wondering. But then, there is that whole expense question. How do I get around it? I’ve got a tube of the AVS cream on my Christmas list. I figure if I’m a good girl this year, Santa will drop some in my stocking. Tomorrow, I’m going to review a gorgeous (gorgeous) book. See you then! December 22, 2011 Other Thimble Explorations! Hi Mary! Where can you buy the AVAS cream from? I know Access carries it, but they are wholesale only from my understanding. Do you know of a store that carries it? And thank you for the review, I’ve been wondering if it was worth questing for or not. You can find it at Fireside Stitchery & Needle in a Haystack, among others. Fireside Stitchery and Needle in a Haystack both have websites, so if you Google them, they’ll come up! Thanks so much! I’ve ordered from Needle in a Haystack before, never noticed the cream. I haven’t checked out Fireside before but I will now. I have a constant problem with my hands getting dry, so this will really help. I’ve been doing the sugar/olive oil scrubs, but it’s hard to keep up with them. This will really help me. my children have eczema problems. in these cases, I use calendula cream or ointment to cure them. perhaps could you try it. According to a dermatologist friend, the best thing to use is (wait for the drum roll) petrolatum, better know by the brand name Vaseline. Every time you wet your hands (or other dry skin), take a LITTLE Vaseline, mix it under the tap with water and spread it around. They pat dry. If your hands feel sticky or greasy, you have used too much. There should be just enough to keep the water in your skin, and not so much to mess up fabric or fiber. Look on the label of the fancy cream, and see what is in it. That is what counts. If the first ingredient is water, petrolatum, or glycerin, you are wasting your money. If it is used sparingly it probably lasts awhile. i buy expensive cleanser for my face because it lasts me 12 months and suits my ssensitive skin. i imagine this is similar and the extra cost worthwhile. I’ve heard of different stitchers lotions, but never one specifically for a certain fiber. At first, I thought this review was going to be along the lines of here’s a lotion, works great, bought with no special package for $, and here’s the exact same lotion with special needleworker’s packaging on sale for $$$. I’m glad to hear the Au Ver a Soie is worth the price. Although at that price, I’d probably invest in one of those toothpaste tube winders that get every last bit out, and then cut the tube open just to make sure. I’m also glad to hear the Stitcher’s Lotion is good too. I have used AVAS for years and though its not 45.00 its still expensive for me BUT very well worth it! It goes along way as a little dab will do ya! I would be concerned using Vasoline on my hands and the stitching because even a little will leave a residue. I would try using it maybe at night to soften my hands but would wash my hands very well then us AVAS just before stitching. 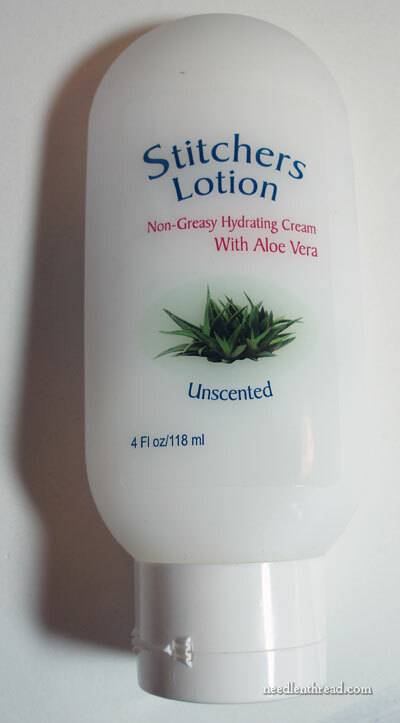 I have also used stitchers lotion but feel AVAS is still the best. Where can I buy the AU ver a Soie creme? Hi Mary, do you still use this AVS lotion I am looking for a hand cream that I can use with my stitching but can’t find this one available anywhere, so not sure if you can still buy it? If not which lotion are you using now? I have heard some stitchers reccommend gloves in a bottle or udderly cream. I really don’t know where to start and don’t want to ruin my stitching. Your help would be appreciated. Hi, Adele – they aren’t producing the AVS lotion anymore. There’s a lotion called Stitcher’s Lotion that is supposed to be pretty good, and a lot of people swear by gloves in a bottle and udder cream. I don’t normally put lotion on right before stitching these days. I just make sure my morning and evening routine include a good slathering, to keep my hands from getting too terribly scaly! I’m wondering where you buy your AVS hand cream. Thanks for your site and your recommendations! Hi, Lindsay – I believe it’s no longer made. If they are still making it, it’s not available in the US – you’d have to check Au Ver a Soie in France directly.